To Cite: Gokce S, Kurugol Z, Cerit Z, Cicek C. The Effect of Respiratory Syncytial Virus on the Severity of Acute Bronchiolitis in Hospitalized Infants: A Prospective Study from Turkey, Iran J Pediatr. 2018 ; 28(2):e61034. doi: 10.5812/ijp.61034. Objectives: Respiratory syncytial virus (RSV) is a major cause of respiratory infections in infants and children. The aim of this study was to evaluate clinical significance of respiratory infections as single pathogen RSV, respiratory viruses with RSV and those with bronchiolitis caused by other respiratory viruses. Methods: A total of 316 throat swabs were collected from children diagnosed with acute bronchiolitis. Real-time polymerase chain reaction was used to identify the viruses in the samples. The subjects were divided into three groups: single pathogen RSV, agents with RSV and agents without RSV. Binary logistic regression analysis was used to evaluate the corelation between single and multiple RSV infection group and infections without RSV group for parameters including age, wheezing, supplemental oxygen therapy. Results: The overall positivity for viruses in the study was found to be 75% with a co-infection rate of 34.2%. Compared to children with RSV alone, children with any other agents accompanying RSV, were not very likely to have fever, wheezing or supplemental oxygen therapy. Conclusions: The findings of our study suggest that RSV still represents a large burden of bronchiolitis since it is associated with the hospitalization of children, particularly those less than six months old. We can not foresee the clinical presentation of specific agent or agents in connection to being with or without RSV in infants with any level of bronchiolitis. The study agrees with the concept that co infections with or without RSV do not increase the severity of the disease. Respiratory syncytial virus (RSV) is usually the cause of more than 50% of cases of acute bronchiolitis in infants (1). World health organization (WHO) has reported that RSV is the causative pathogen for over 30 million new acute lower respiratory infection episodes including acute bronchiolitis in children under five years of age and it gives rise to more than 3.4 million hospital admissions and 160,000 deaths every year (2). CDC stated that the avarage RSV hospitalization rate was 5.2 per 1000 children under 24 months from 2000 to 2004 (3). Acute bronchiolitis is one of the most important conditions in infants under 24 months as it is very common and the leading cause of hospitalization. Recent studies have investigated the differences of the clinical outcome for those with sole viral infection compared to co-infection with or without RSV. Some authors also stated that acute RSV bronchiolitis was associated with more severe diseases compared to patients without RSV (4-6). However, according to some authors there is no relation between RSV-coinfections and increase in the disease severity (7, 8). Due to the fact that the clinical presentation of the illness seen with sole viral infection is very similar to those seen with co-infection; the clinical relevance of specific agent or agents whether or not with RSV in infants with severe bronchiolitis is still unclear (3). The aim of this study was to determine the frequency of respiratory pathogens among infants hospitalized with acute bronchiolitis and to determine the clinical significance of respiratory infections caused by single pathogen RSV, respiratory viruses with RSV and those with bronchiolitis caused by other respiratory viruses without RSV. The other purpose of this study was to find out whether any difference in clinical course and presentation among the three groups exists. This prospective cross-sectional study of children hospitalized with acute bronchiolitis was conducted between January 2013 and October 2016 at the general pediatric ward of children’s hospital, Ege university, Turkey, a tertiary care pediatric teaching hospital. The ethics committee of Ege University approved the study. (ethics committee number: E.155326). Infants who were hospitalized with acute bronchiolitis were recruited with informed written parental consent. Acute bronchiolitis was defined as an acute respiratory illness characterized by increased respiratory effort (tachypnea and/or use of accessory respiratory muscles), and expiratory wheezing and/or crackles and/or apnea. Included were previously healthy infants < 24 months of age with first attack of acute bronchiolitis. Infants who had not been hospitalized within 2 weeks before being admitted to hospital, those who developed nosocomial acute bronchiolitis, or those who had a known history of bronchopulmonar dysplasia, chronic heart disease or chronic lung disease were excluded. Infants who were born prematurely were also excluded from the study. On hospital admission, clinical parameters of infants including wheezing, retraction, respiratory rate and general situation were evaluated to ascertain a respiratory score. Each parameter was given points from zero to three and then the points were added up to describe the severity of acute bronchiolitis (9). According to the points, 0 - 3 was mild, 4 - 8 was moderate and 9 - 12 was considered severe bronchiolitis. As laboratory outcome variables, white blood cell count, percentage of lymphocytes, and C-reactive protein (CRP) were measured within the first 72 hours of admission. A nasal smear was obtained from each infant within 24 hours of admission and tested for the presence of respiratory syncytial virus (RSV), influenza virus type A and B (Inf-A, Inf-B), adenovirus (Ad), parainfluenza viruses (PiV types 1 - 4), human rhinovirus (Hrv), human coronavirus (HCoV), human metapneumovirus (HmpV) and human bocavirus (HBoV) with real-time multiplex PCR methods (RealAccurate®, respiratory RT PCR, PathoFinder, Netherlands and Seeplex® RV15 ACE Detection, Seegene, South Korea). Statistical analyses were performed by using IBM SPSS v.21 for personal computers (Chicago, IL, USA). The subjects were divided into three groups: single pathogen RSV, agents with RSV and agents without RSV. Results are presented as mean ± standard deviation for continuous variables and as frequencies and percentages for categorical variables. We initially used frequency tables and performed chi-squared analysis for categorical variables the Shapiro Wilks test was used to test the distributions of age, respiratory score, duration of cough, length of stay in hospital, duration of systemic steroid application, white blood cell/mm3, Lymphocytes/mm3 and C-reactive protein /mg/dL. Because all these variables did not show normal distribution, we used nonparametric tests such as Mann-Whitney U test and Kruskal-Wallis test for group comparisons. Binary logistic regression analysis was used to evaluate the corelation between single and multiple RSV infection groups and infections without RSV group for parameters including age, wheezing, supplemental oxygen therapy, etc. The variables with a P value of < 0.05 and odds ratios and 95% CIs that did not include 1 were considered significant. From January 2013 to October 2016, a total of 316 infants < 24 months of age were hospitalized with acute bronchiolitis and enrolled in this prospective study. At least one agent was determined in 237/316 (75%) infants. The results of incidence of respiratory viruses or in combination with RSV in infants hospitalized with acute bronchiolitis during the study period are shown in Table 1. Figure 1 also shows the distribution of viruses detected as a single infection or in combination with RSV. 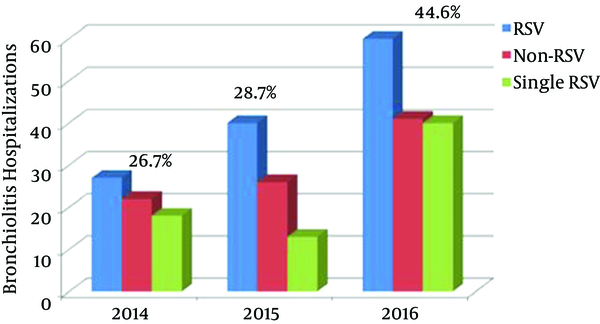 The total number and percentage of yearly hospitalizations for bronchiolitis are summarized in Figure 2. 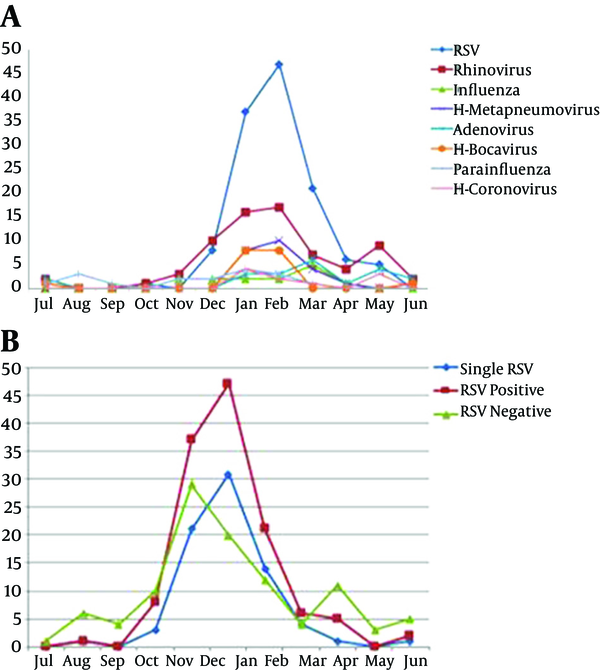 Analysis of the monthly distribution of acute bronchiolitis indicated that RSV whether as a sole pathogen or in association with other pathogens was prevalent almost throughout the whole winter season, mostly in February. aThe percentages were calculated by dividing the value over the total group number of patients tested (n = 316). bThe percentages were calculated by dividing the value over the group number of patients tested (n = 156). Hospitalizations increased from 2013 to 2016. The X axis represents each study year, the Y axis shows the total number of hospitalizations. The percentages were calculated by dividing the value over the total number of patients tested (n = 316). Figure 3. A: Monthly distrubution of all pathogens in hospitalized children. B: Monthly distrubution of RSV (single and co-infection) and non-RSV in hospitalized children. The study group was divided into 3 subgroups, namely single RSV (n = 76, 24%), other viruses with RSV (n = 51, 16.2%) and without RSV (n = 110, 34.8%). demographic and clinical characteristics are shown in Table 2. The overall mean age of the infants was 7 months and of the patients 63.6% were male (n = 201). The most frequent age range of infants with acute bronchiolitis was 1 - 6 months, accounting for 63.6% of all included cases. The infants diagnosed with only RSV infection were significantly younger than non-RSV infants (4.8 ± 4.7 vs 8.3 ± 7.3 months, P = 0.001), however, there was no age difference between those with RSV and those without RSV (P = 0.181). The infants were admitted to hospital with two main symptoms being cough (91%; n = 289) and wheezing (57.9%; n = 183). As can be clearly seen, there was no significant difference between the clinical findings of the three groups. aData are presented as number (%), unless otherwise speciﬁed. SD, standard deviation; Kruskall-Wallis non-parametric or X 2 tests were performed, and were, if signiﬁcant, followed by Mann-Whitney U tests or Chi-squared tests for individual comparisons. 1 Single RSV versus non-RSV. The binary logistic regression model for viral etiologies single RSV or other pathogens is shown in Table 3 controlling for demographic and clinical characteristics as well as site, and significant independent predictors for viral etiology. Compared to children with RSV alone, children with any other agents accompanying RSV, were not highly likely to have fever, wheezing or supplemental oxygen therapy. This current study of the infants hospitalized with bronchiolitis has proved once again that acute bronchiolitis is an important cause of hospitalization in infants, mostly younger than 6 months of age. Using multiplex real time PCR tecnique we demonstrated that at least one respiratory viral pathogen was responsible for bronchiolitis in 75% of our cases. As shown by other studies, in our study, RSV was the most frequently identified respiratory virus in acute bronchiolitis, accounting for 40.1% of all respiratory viruses in young infants (5, 6, 9-13). Antunes et al. (13) showed that RSV incidence was 58.1% and Stempel et al. (14) found this as 77% in the RSV epidemic season. In keeping with previous studies, we found that the respiratory viruses could occur as coinfection with others; within a count of 25.6% dual, tripple or more; dual being the most frequent. Ong et al. (15) showed in their study that RSV bronchiolitis associated with other pathogens was present in 10% of the infants. In a multicenter study, it was reported that a co-infection rate was 9% (6). Hence, respiratory viruses tend to be co-infections, and RSV has a high rate of co-infection with others, namely influenza, rhinovirus (RV), human metapneumovirus (hMPV) and human bocavirus (HBoV) and also with bacterial pathogens (5). The clinical features of acute bronchiolitis seen with sole respiratory infection is very similar to those seen with other respiratory viruses, single, dual or more. However, some reports have suggested that RSV-associated bronchiolitis increases the severity of the disease. There are reports showing that multiple infections were associated with longer hospital stays than those with single RSV infections (4, 5, 16). However, the clinical significance of RSV in infants with acute bronchiolitis has not been clearly defined. A study from the United States showed that previously healthy infants with RSV had more severe bronchiolitis than those hospitalized with non-RSV bronchiolitis. In that study, it was also determined that some risk factors like prematurity were not associated with the severity of the disease (5). A study by Hervas D et al. (16) focusing on the clinical course of RSV infection in infants hospitalized with acute bronchiolitis stated that RSV infection played an important role in the increased severity of acute bronchiolitis, and that RSV acute bronchiolitis was associated with a longer hospital stay and greater oxygen requirement compared with non RSV acute bronchiolitis. Another multicenter-prospective study of 366 children, mean age 17.5 ± 16.6 months with RSV bronchiolitis, found a higher clinical score on admission and significant difference in length of stay for the patients with RSV alone compared to those who were non RSV (4). In contrast, in a prospective study Martinez-Roig et al. (17) evaluated 463 pediatric patients aged between 7 days and 15 years, hospitalized with respiratory infections, found no association between the number of viruses and clinical severity. Similarly, a study conducted in Canada, it was found that equivalent clinical severity was observed between children with single virus infection and virus coinfection during viral respiratory infections (18). Ganavi Ramagopal et al. (19) reported that no statistically significant difference was observed in clinical parameters, except wheezing. They found that subjects with RSV who had wheezing on admisson were higher in percentage significantly than subjects without RSV (89.7% vs 41.5%, P value < 0.001). Another review which has been collocated by Edward Anthony Goka, found inconclusive results on the role of co-infections on the severity of the respiratory disease and bronchiolitis (20). In the present study, we found that there was no difference in the clinical findings, including wheezing and respiratory score on admission, for RSV positive or single pathogen RSV patients compared to those who were RSV negative. Additionally no difference was seen in disease severity, or in laboratory tests, between sole pathogen RSV cases and others positive for other pathogens. There were no significant differences in terms of several factors among binary logistic regression models of single RSV or other infections associatrd with RSV. We only investigated the hospitalized patients with acute bronchiolitis, and not the infants who applied to the emergency services or out-patient policlinics, so our study group was small in number. Although the detection rate was high, viruses could not be identified in nearly 25% of enrolled patients. It is possible that some subjects may have had infection with other possible agents such as atypical or bacterial pathogens. In conclusion, the findings of this study confirm that RSV still represents a large burden of bronchiolitis worldwide since it is associated with the hospitalization of children, particularly those less than six months old. We can’t foresee the clinical presentation of specific agent or agents in connection to being with or without RSV in infants with any level of bronchiolitis. Therefore, we agree with the concept that co infections with or without RSV do not increase the severity of the disease. However, we believe that studies should focus on sole versus multiple infections in larger groups to prevent the bias that may occur when analyzing all the results. 1. Wainwright C. Acute viral bronchiolitis in children- a very common condition with few therapeutic options. Paediatr Respir Rev. 2010;11(1):39-45. quiz 45. doi: 10.1016/j.prrv.2009.10.001. [PubMed: 20113991]. 2. WHO . WHO Consultation on respiratory syncytial virus (RSV) vaccine development. WHO; 2015. 3. Zorc JJ, Hall CB. Bronchiolitis: recent evidence on diagnosis and management. Pediatrics. 2010;125(2):342-9. doi: 10.1542/peds.2009-2092. [PubMed: 20100768]. 4. Bamberger E, Srugo I, Abu Raya B, Segal E, Chaim B, Kassis I. What is the clinical relevance of respiratory syncytial virus bronchiolitis? : findings from a multi-center, prospective study. Eur J Clin Microbiol Infect Dis. 2012;31(12):3323-30. doi: 10.1007/s10096-012-1699-2. [PubMed: 22825246]. 5. Garcia CG, Bhore R, Soriano-Fallas A, Trost M, Chason R, Ramilo O. Risk factors in children hospitalized with RSV bronchiolitis versus non-RSV bronchiolitis. Pediatrics. 2010;126(6):1453-60. doi: 10.1542/peds.2010-0507. [PubMed: 21098154]. 6. Mansbach JM, Piedra PA, Teach SJ, Sullivan AF, Forgey T, Clark S. Prospective multicenter study of viral etiology and hospital length of stay in children with severe bronchiolitis. Arch Pediatr Adolesc Med. 2012;166(8):700-6. doi: 10.1001/archpediatrics.2011.1669. [PubMed: 22473882]. 7. Wolf DG, Greenberg D, Kalkstein D, Shemer-Avni Y, Givon-Lavi N, Saleh N. Comparison of human metapneumovirus, respiratory syncytial virus and influenza A virus lower respiratory tract infections in hospitalized young children. Pediatr Infect Dis J. 2006;25(4):320-4. doi: 10.1097/01.inf.0000207395.80657.cf. [PubMed: 16567983]. 8. Wilkesmann A, Schildgen O, Eis-Hubinger AM, Geikowski T, Glatzel T, Lentze MJ. Human metapneumovirus infections cause similar symptoms and clinical severity as respiratory syncytial virus infections. Eur J Pediatr. 2006;165(7):467-75. doi: 10.1007/s00431-006-0105-4. [PubMed: 16607540]. 9. Wang EE, Milner RA, Navas L, Maj H. Observer agreement for respiratory signs and oximetry in infants hospitalized with lower respiratory infections. Am Rev Respir Dis. 1992;145(1):106-9. doi: 10.1164/ajrccm/145.1.106. [PubMed: 1731571]. 10. Ralston SL, Lieberthal AS, Meissner HC, Alverson BK, Baley JE, Gadomski AM. Clinical practice guideline: the diagnosis, management, and prevention of bronchiolitis. Pediatrics. 2014;134(5):1474-502. doi: 10.1542/peds.2014-2742. [PubMed: 25349312]. 11. Purcell K, Fergie J. Lack of usefulness of an abnormal white blood cell count for predicting a concurrent serious bacterial infection in infants and young children hospitalized with respiratory syncytial virus lower respiratory tract infection. Pediatr Infect Dis J. 2007;26(4):311-5. doi: 10.1097/01.inf.0000258627.23337.00. [PubMed: 17414393]. 12. Midulla F, Scagnolari C, Bonci E, Pierangeli A, Antonelli G, De Angelis D. Respiratory syncytial virus, human bocavirus and rhinovirus bronchiolitis in infants. Arch Dis Child. 2010;95(1):35-41. doi: 10.1136/adc.2008.153361. [PubMed: 19822538]. 13. Antunes H, Rodrigues H, Silva N, Ferreira C, Carvalho F, Ramalho H. Etiology of bronchiolitis in a hospitalized pediatric population: prospective multicenter study. J Clin Virol. 2010;48(2):134-6. doi: 10.1016/j.jcv.2010.03.002. [PubMed: 20362492]. 14. Stempel HE, Martin ET, Kuypers J, Englund JA, Zerr DM. Multiple viral respiratory pathogens in children with bronchiolitis. Acta Paediatr. 2009;98(1):123-6. doi: 10.1111/j.1651-2227.2008.01023.x. [PubMed: 18785966]. 15. Ong GM, Wyatt DE, O'Neill HJ, McCaughey C, Coyle PV. A comparison of nested polymerase chain reaction and immunofluorescence for the diagnosis of respiratory infections in children with bronchiolitis, and the implications for a cohorting strategy. J Hosp Infect. 2001;49(2):122-8. doi: 10.1053/jhin.2001.1044. [PubMed: 11567557]. 16. Hervas D, Reina J, Yanez A, del Valle JM, Figuerola J, Hervas JA. Epidemiology of hospitalization for acute bronchiolitis in children: differences between RSV and non-RSV bronchiolitis. Eur J Clin Microbiol Infect Dis. 2012;31(8):1975-81. doi: 10.1007/s10096-011-1529-y. [PubMed: 22240853]. 17. Martinez-Roig A, Salvado M, Caballero-Rabasco MA, Sanchez-Buenavida A, Lopez-Segura N, Bonet-Alcaina M. Viral coinfection in childhood respiratory tract infections. Arch Bronconeumol. 2015;51(1):5-9. doi: 10.1016/j.arbres.2014.01.018. [PubMed: 24666712]. 18. Asner SA. Respiratory viruses in pediatrics: what's new?. 17. Rev Med Suisse; 2016. p. 358-61. 19. Ramagopal G. Demographic,Clinical and Hematological Profile of Children with Bronchiolitis: A Comparative Study between Respiratory Synctial Virus [RSV] and [Non RSV] Groups. J Clinical Diagnostic Res. 2016. doi: 10.7860/jcdr/2016/20331.8262. 20. Goka EA, Vallely PJ, Mutton KJ, Klapper PE. Single and multiple respiratory virus infections and severity of respiratory disease: a systematic review. Paediatr Respir Rev. 2014;15(4):363-70. doi: 10.1016/j.prrv.2013.11.001. [PubMed: 24361079].